In reading this I couldn’t help but see the irony in the Santa Claus fairy tale and the beliefs of most Americans. Many, many Americans are having a good time believing that they are immortal, that nothing bad can happen to them because they have a friend in Jesus, the universe is 6,000 years old, and on and on. And then evil atheists come along and tell them it’s mythology. Want to lose Facebook friends fast? Start poking holes in these beliefs. Researching holy books and archeology reveals with clarity that all religions are completely man-made and mythological. It’s also clear based on what we see today that there is no evidence of god(s) actively participating in any measurable way in the universe (and don’t think people haven’t searched for it). Gods used to have so many jobs: lighting, thunder, stars, moons, life. Now we find out that the universe is a star, planet, moon, and maybe life making machine. That life can evolve over billions of years to appear designed. God’s jobs have been reduced to spawning the universe and spawning life. If there are natural explanations for that, believers are in trouble. In the Bible, God is constantly interfering in reality. He’s walking with people, he’s talking with people, he’s carving stone tablets. Now, he’s implied in DNA, he’s implied in physical constants. He’s more subtle today apparently. He needs apologists to prove he exists. Thanks William Lane Craig! So I ask myself, why should I think Yahweh (Bible God) and Jesus are real but Zeus and Hercules are just myths? Because all my friends and neighbors believe it? Is that evidence? Didn’t all the friends and neighbors in Greece believe in Zeus and Hercules just as much? What experiment (reading the Bible isn’t an experiment) can I run where the test result conclusively reveals Yahweh is God? We laugh at the gods of Olympus now. How could those ancients be so stupid and backward? Of course, lightning is caused by atmospheric pressures and turbulence and water vapor, not Thor and Apollo. Of course planets revolve because of gravity, not some god dragging them around on strings. Hahaha. Now, let’s bow our heads and pray that our new God (Yahweh) heals Aunt Mary’s cancer. And tomorrow, I’ll pray he helps me find my car keys. Christians are having so much fun going to church and reading books that support their beliefs (and not much else) that they don’t realize how silly their beliefs sound to a non-believer. And furthermore, their myths are no different than any other myths that we laugh at today. They are worshipping the demigod Jesus after all. Sons of God were procreating with humans (Genesis 6). Actually I think they don’t like this story because it’s polytheistic. The organization of fossils just happened to sort taxonomically by age and complexity by receding flood water (Noah’s ark and other Bible Nonsense). This is the Christian argument against biological evolution. All the worlds races and languages were created in one day because people built a tower too high for God’s liking (Genesis 11) How tall could it have been really? Taller than the World Trade Center towers? The sun went dark for 3 hours (Matthew 27) Keep in mind the longest solar eclipse is 7 minutes and that just darkens a relatively small spot on the earth. Does this list sound like history? Or mythology? Even a believer may admit that these sound like mythology. But they believe these stories are true historical accounts. But to a non-believer, they sound just as mythological as Thor throwing down lightning bolts. 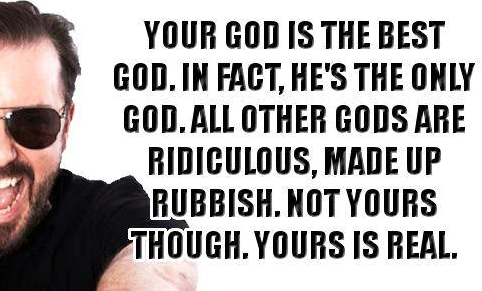 Zeus is myth, Apollo is myth, Hercules is myth, Yahweh is myth, and surprisingly even Jesus is myth. I think that most people with an open mind, especially if not indoctrinated as children, who do the research will discover the truth. That these gods are all human creations and myths and they survive today, even with all the knowledge we have gained from scientific discovery, because we are all afraid – we are scared to death of our mortality. And I can prove it. No one jumps for joy at their terminal diagnosis (even believers convinced they are going to heaven). We are willing to believe in talking donkeys and snakes if it means we don’t have to die.